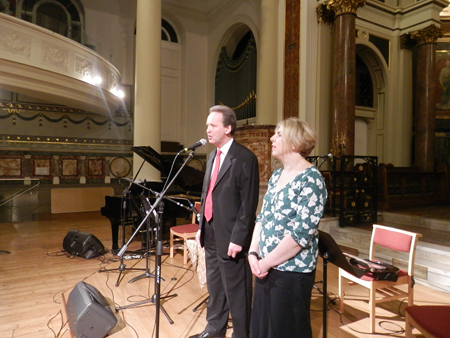 On UN International Peace Day, Universal Peace Federation - UK helped Tally Koren to organise a wonderful concert of Middle Eastern musicians in support of the Parents Circle Family Forum. 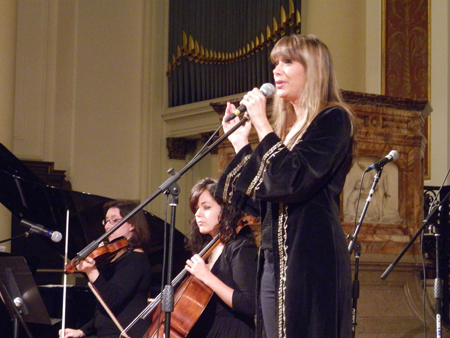 'Music for Peace in the Middle East' included Palestinian Oud player and singer, Nizar Al-Issa, guitarist Udi Glazer, Anna Kempton on Chello, violinist Julia Stone and Woody Dean on the piano and was held in the classic church background of St Peter's in Notting Hill. Photo link here. It was so good to see the blend of styles and alternation of songs and performances from Persian, to Palestinian and Israeli. (Report on www.BarkBiteTravel.wordpress.com) It was moving to see the efforts made to understand and blend cultural styles and characters to make this a stirring and memorable performance. UK Representative, Diane Taylor (in photo on right), introduced the The Parents Circle - Families Forum (PCFF), which is a joint Palestinian Israeli organization of over 600 families, all of whom have lost a close family member as a result of the prolonged conflict. Joint activities have shown that the reconciliation between individuals and nations is possible and it is this insight that they are trying to pass on to both sides of the conflict. Moreover, the PCFF has concluded that the process of reconciliation between nations is a prerequisite to achieving a sustainable peace. The organization thus utilizes all resources available in education, public meetings and the media, to spread these ideas. The PCFF was established in 1995 - by Mr. Yitzhak Frankental and several bereaved Israeli families. In 1998 the first meetings were held with a group of Palestinians families from Gaza who identified with the call to prevent further bereavement through dialogue, tolerance, peace and reconciliation. NAYEF RASHED - Has appeared in such television favourites as Only Fools and Horses and The Bill and feature films such as Navy Seals and Salmon Fishing in the Yemen. UDI GLASER An accomplished guitarist, composer and experienced guitar teacher. Composing original music for a wide array of film genres and theatre plays. DEAN ROSS American pianist and keyboard player who has recorded and toured internationally with famous bands and singers . ANNA KEMPTON Hungarian cellist, she has performed as a Chamber musician and soloist playing in concert halls such as the Royal Festival and Festspielhaus in Salzburg. 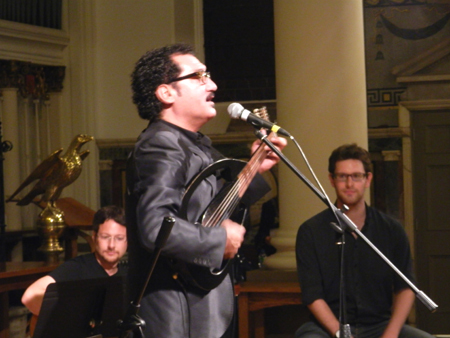 HAMID RASTI Iranian Santur player and one of the only players in the UK. VOCALLY SOUND London Gospel Choir, have performed with Westlife, Beverley Knight, Boy George and in special events. JULIA STONE Violin player who plays with the band Dirty Leaves and has played for a number of West End theatrical productions. MICHA SMITH A teacher and freelance musician who has been playing the darbouka and other hand drums for ten years.